Nutshell: douchebags leave earth, which gets blown up, the maniacs. 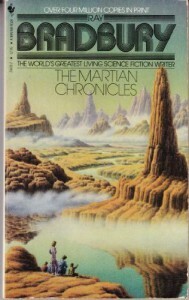 Slick collection of short fictions set within the frame of Mars colonization. Comical that an early expedition is locked up in an indigenous insane asylum and euthanized. Oh, you’re from Earth? But of course you are! &c.
Setting has Earth filled with “wars and censorship and statism and conscription” (31). Martians die off because of varicella (51) inflicted on them by an early failed expedition. Blank slate that results is filled with US culture, including, apparently, many African Americans who leave Earth to be rid of apartheid US policy, much to the chagrin of racist employers on Earth. Great bit about censorship of the arts. Slick precursor of Mieville’s [b:The City and the City|4703581|The City and the City|China Miéville|http://d.gr-assets.com/books/1320475957s/4703581.jpg|4767909] in the meeting of a martian and earthling who can’t really see each other. Final act, after Earth destroys itself, is haunting, unforgettable, a slowly dawning horror, executed with perfect subtlety. Recommended for those having hallucinations with time and spatial persistence, persons for whom Earth now was dead, and readers afraid of the word ‘politics’ as a synonym for communism.